When we heard that one of our athletes had been injured, right after moving to a new city (Seattle) and starting in with a new league (Rat City! ), we were feeling her pain… what a way to kick off a new league experience! Yuck! With injuries such a regular part of the game (sadly)! we know there are many of you out there reading this who are in a similar situation (or have a teammate who is), feeling like this moment is doom and gloom. That’s completely natural. But Mollytov Cocktail was not about to be held back. She kept working on a modified program that her RDA coach, BadBrand set up for her so she could keep up her strength and endurance while not skating, and in the meantime came up with a killer plan to turn everyone’s frown upside-down. The moment my wrist splintered during my first league scrimmage with Rat City Roller Derby, it wasn’t the pain that made me weep. It was the thought of spending time away from my skates. 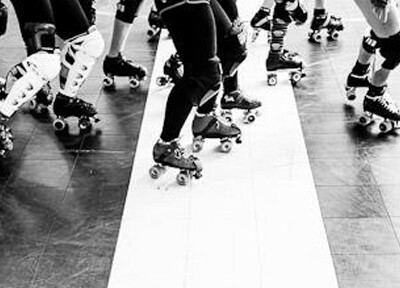 Roller derby players, even the freshest of meat, know that injuries are inevitable in the game we play. But after nearly two years of playing derby without any serious injury, I was feeling invincible. My injury meant the opposite was true. But I’m glad it happened, because sitting on the bench for six weeks was the best thing to happen to my derby career. 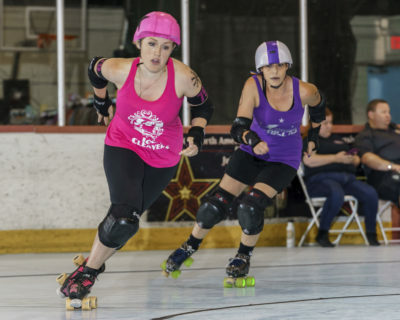 I started playing roller derby in 2017. I joined a USARS league and fell in love. I ate up the physical challenges that derby laid before me. 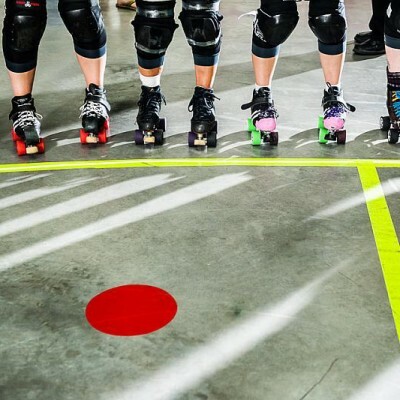 Not to mention, after years of wondering how adults meet people and make friends, I finally realized the secret – roller derby! I followed the usual path. After passing minimum skills, I joined a team. I played a season and a half with them, then joined a WFTDA league. 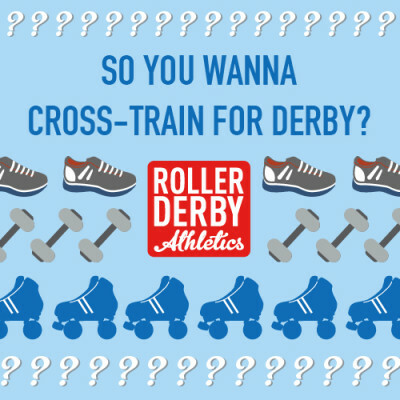 Because the WFTDA and USARS rulesets differ, I had to spend several weeks back in basic training with the second league. The experience was helpful, but I longed to scrimmage and play the game I adored. Just before drafts were to take place, I moved to Seattle and joined Rat City Roller Derby. I missed out on being drafted in that second league, but I was thrilled to have a top-ranked, Division 1 WFTDA team in my new city. And after transferring in, I was placed in the draft pool just in time for December 2018 draft. I attended my first practice. Then my second. And on the third day, I broke my right wrist. I wish I could say it happened in some fantastic fall after an apex jump or that I earned a gazillion points after calling off the jam using my broken limb. It was not at all cool. I simply dropped to the ground after meeting the other team’s strong wall, landing square on my wrist. I sobbed all the way to the emergency room. After all of the transferring and off-season cross-training work I put in between leagues, I was facing weeks off skates. Worse, I would miss the draft. Once again, I would miss my opportunity to be part of a team, to play the game I loved. 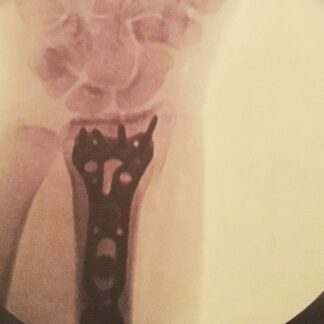 Two weeks later, a surgeon attached metal screws and a plate to my radius and joint. “How long,” I asked him. He knew what I meant. I tried not to think about it. Instead, I looked at my recovery one day at a time. I moved forward. I immersed myself in reading testimonials, blog posts, anything I could get my hands on that discussed athletic injury recovery and how to overcome the mental frustration. I reminisced with and was inspired by past photos of myself playing. And I did the things you’re supposed to do when you’re recovering from an injury. I rested and rehabbed. I focused my energy into the leg and core workouts my RDA coach BadBrand assigned to me. I asked for help when I needed it, and I advocated for myself when I went to appointments with my physical therapist and doctors. But when my friends and new leaguemates encouraged me to attend Rat City scrimmages. I demurred. Even when I could skate, watching others play derby without being able to play was hard on me. When I do, my body twitches, mimicking the moves I would make if I were on the track. It is physically and mentally taxing. But I knew they were right. So I attended every scrimmage and bout I could. While I watched, my heart ached. It’s obvious to anyone who watches them that Rat City is a high-caliber league. The walls are solid, the jammers run more than they skate and the athleticism is intense. How would I learn how to play with this league if all I could do was watch? Most nights after those scrimmages, I went home and crumbled from disappointment. Then, something broke through the fog. On my fifth night I watched league scrimmage, I offered to help the non-skating officials with scorekeeping (pro tip: if you’re injured, this is a very good use of your time, and your officials will be very grateful!) When you keep score, you have to watch the jammers closely, noting their every move for statistical purposes. Of course, I had been watching the same jammers for weeks, wanting to soak up their skills and memorize their movements. 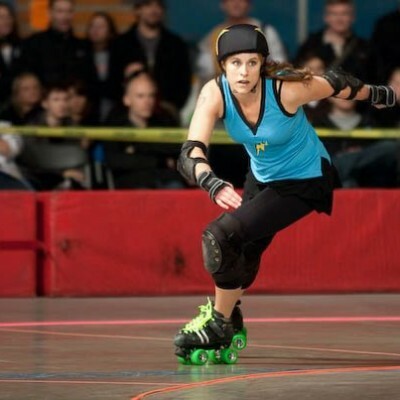 Before I joined Rat City, I felt I was a capable jammer and derby player. I could get through walls, though I didn’t really have a strategy. I could block efficiently enough. I could juke and evade. I knew the league was of a high level, but I thought I had all the skills I needed. Instead, on that first scrimmage night, I smacked into walls and hardly made it out of packs. I lost quick jammers and was slow to reform. Turns out, I didn’t have all the skills I needed. And then, of course, I broke my wrist. But without that experience, I wouldn’t have realized all that my derby game is missing. Every skill I included on my list was an ability I was lacking. I need a strategy to get through a pack, to not just jump in and hope for the best. I need to be comfortable being on my toe stops 90 percent of a jam. I need to hit harder and commit to memory what an effective hit looks like. A good derby player needs a plan. Until this injury, I thought I was doing everything I could to be a better derby player. This injury forced me to visualize and identify what I need to do to be a better player. I would have never taken the time to do that had I not been forced to sit on the sidelines. In early January, I will remove my cast and graduate physical therapy. I’ll get back on my skates just in time for the next Rat City draft. By then, my to-do list will etched in my brain and I will ask my coaches and leaguemates to help me master every skill on it. I’ll return to the sport I love as a better skater, with more awareness and a plan. And for that, I have to thank my broken bone. We loved getting to share Mollytov’s experience of injury in the sport we all love. Her attitude towards injury and fitness planning is inspiring! Thank you for this. I just fractured my ankle last Saturday during a scrimmage and I’ve been feeling so lost.